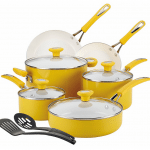 Paula Deen Cookware Sets were designed with the idea of cooking daily and cooking together with family and friends in mind. Paula Deen was inspired by the memories of her childhood when she has created the cookware sets that can be found on the market. Men might be the most famous chefs around the world, but Paula Deen’s products are addressed to those women who cook daily for their families and who are supposed to enjoy every minute of their daily kitchen chores. 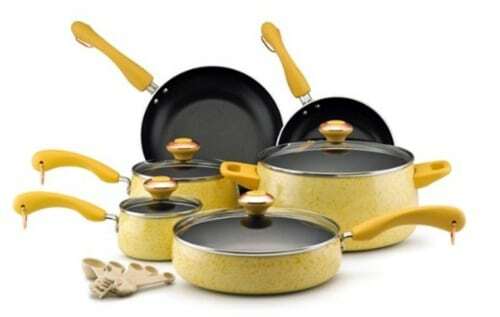 Paula Deen Cookware Sets include useful pieces that will not be left hanging on the wall for a long time. Every piece of the 12-pieces counted in her sets has a well-defined purpose and deliver the best possible results. The handles are especially massive and each has a copper-plated ring at the end. Ensuring a safe grip and enabling you to beautifully hang the pans on your kitchen’s wall, the rubberized handles do not overheat. The combination between stainless steel, aluminum and copper is a well-know breakthrough in the world of kitchen appliances and it was also used for the fabrication of Paula Deen Cookware Sets. The convenient variety of sizes and the beautifully brushed surfaces are a big plus as well. Paula Deen is a constant appearance in the world of cooking and mass-media. 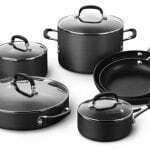 She shares her experience with regular people and she tries to make their lives easier by recommending the best cookware. Listed among the 100 Most Influential Celebrities, Paula Deen has cooked for an impressive number of celebrities. It looks like she knows what she is doing, so she has partnered with the Meyer Corporation and with the cooking.com website in order to produce and make available to the world sets of cookware resulted from her personal experience. In addition, Paula Deen is a known author of best-selling cooking books. She is a knowledgeable chef and a true inspiration for the home cook. 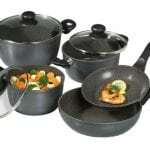 High-quality materials – The cookware is made of stainless steel and a thick aluminum disk base. 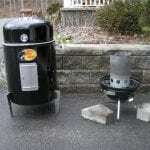 The full cap of copper is a notable addition as well, as it conducts the heat very well and it gets hot fairly quickly. Cool and safe handles – The handles have a layer of rubber that protects it from getting too hot and that ensures a non-slide grip. 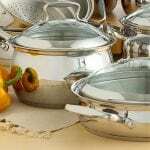 Perfect fitted lids – The lids fit perfectly on the pots and pans. Also, the glass construction enables you to watch your food without taking the lid off every time. Nice variety of colors and sizes – Well-thought sizes and nice combination of colors: silver, black and copper. 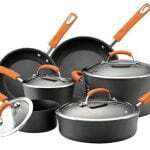 Coating flakes off – Some customers have had inconvenient experiences with the colored version of the 12-piece cookware. The color seems to flake off. Non-stick coat wears off quickly – This flaw might be caused by the usage of metal utensils, which is not recommended at all. Paula Deen is a reliable public person who constantly shares her cooking experience with others. By making this set, she made sure to find a perfect balance between quality and usefulness. 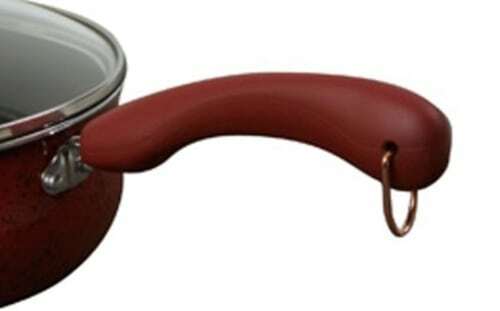 This cookware set is a pleasure to use by amateur cooks who know a few things about non-stick surfaces and stainless steel.